Digimon Adventure Japanese. After much research on "agu" I believe it's short for agurabana, which means a wide, flat nose (which describes Agumon pretty well). Unless he is replaced with another Child Digimon, he cannot be sent to the Dark Area. Every one of the small fireballs he sends out is full of courage! 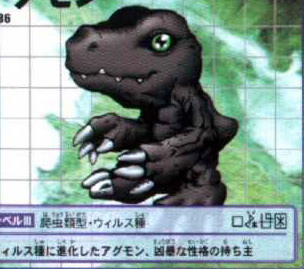 Has the power of "underground"
Unless he is replaced with another Child Digimon, he cannot be sent to the Dark Area. He's not just energetic! He has the makings of the strongest warrior. Has the powers of "underground" and "fighting"
Unless he is replaced with another Child Digimon, he cannot be sent to the Dark Area. A rookie on the evil destroying team, Virus Busters. Has the power of "underground"
During your Preparation Phase if you discard 2 Rookies from your hand you can make one currently in use Field card ineffective. Unless he is replaced with another Child Digimon, he cannot be sent to the Dark Area. 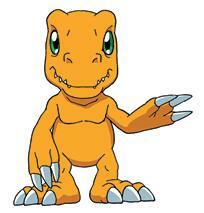 This virus Agumon has a ferocious personality. No special powers.